A pet license simply means that a newly adopted dog or cat is registered within the state where he or she lives. 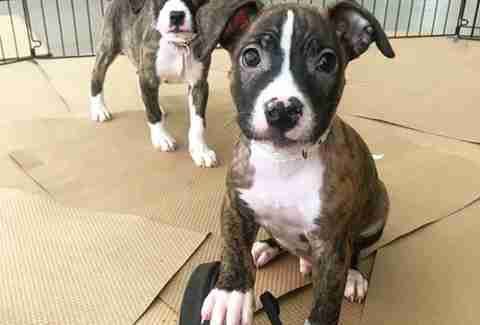 It isn’t just the law in most counties — it can help save a pet’s life too. Most city governments require dog (and sometimes cat) owners to register their pets with a database, much like a car. In order to obtain a license, many times the only requirement is that the animal be up-to-date on his rabies vaccinations, though regulations vary from state to state. Dog owners can license their pets online or at a local government office, a participating animal shelter or a veterinarian’s office. Fees vary depending on the type of license a pet owner is looking to obtain (for example, a service dog license may cost more), the dog’s spay/neuter status and where the pet lives. 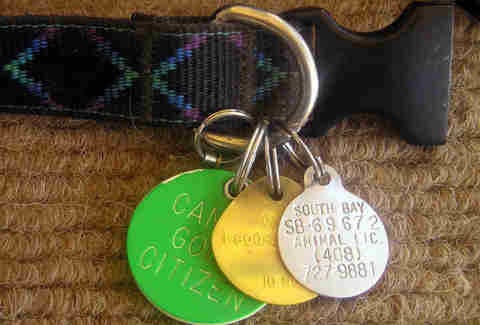 While in public, many places require that a license tag be attached to a dog's collar with his ID number displayed. Opting not to get a pet license for your pup can sometimes result in a fine, but there are other reasons why keeping your dog’s license updated can be beneficial to you and your pet in the long run. A current registration can come in handy should a pet go missing, explains Temma Martin, public relations specialist for Best Friends Animal Society, who has worked in Utah’s animal services for over 20 years. A current license can also help your pet avoid a traumatizing trip to the shelter, saving both time and resources. “Locally, if a pet is lost and an animal control officer finds it and sees the license information, they may take it back to the house instead of a shelter. So there’s no reason for the animal to be taken out of the neighborhood and placed in a cage if they know who it belongs to and they can just take it home again,” Martin says. A license can also help a lost dog receive lifesaving treatment. “For some shelters, if a pet is currently licensed and they are picked up injured, they may be more likely to receive emergency medical care,” Martin notes. Animal control agencies may not choose to risk an expensive procedure without assurance that they will be able to reach the owner. Shelter policies vary, but in many cases, if an animal is picked up needing emergency veterinary care, according to Martin, many rescues either guarantee or are more likely to try, to save those with licenses. No matter how careful we are, pets can get loose, which means getting a license can literally be a life-or-death decision. While a microchip is a great backup form of identification should tags get lost, it doesn’t include vaccination information. If your dog gets loose and someone gets bitten, having the dog's medical history readily available could help save valuable time in an emergency situation. Licensing fees, which may be paid one-time or yearly and vary state by state, provide funding for animal services and shelters, free and low-cost spay/neuter programs and much more. By registering your dog or cat, you are helping other local animals in need.